Where in the World is Photographer Thomas Lee? Who among us hasn’t pulled out a camera, hoping to freeze a moment in time and then share it with those who weren’t there? Who hasn’t wanted to travel to places we’ve never been and capture images of people who look different from us, thereby telling their stories or at least a part of their stories that makes us want to learn more? Thomas Lee is living the dream of being a photojournalist. He graduated two years ago from Northwestern, with majors in Radio-TV-Film and Art Theory and Practice. 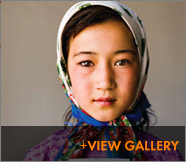 From his current home in New York, he travels to distant locales, photographing women carpet weavers in Afghanistan, child soldiers in Uganda, and Beijing’s changing landscape for the 2008 Olympics. His work has appeared in The New York Times, the International Herald Tribune, PDN (Photo District News), American Photo, and NEED magazine, among other U.S. and international publications. Every image was shot in natural light and none was cropped. He has used a digital camera (a Canon Digital Single-Lens Reflex) for these portraits and for most of his work. Still, he is intrigued by the challenges traditional photographic film presents and recently purchased an all-manual medium-format film camera (a Mamiya 7II rangefinder) and used it during a recent trip to China. Using photographic film reminds him of the canon, the history, the basics of the medium, and its technical constraints. “This puts me in a very different mindset, art first, the journalistic content second. I’d consider it an artist-journalist mindset.” Shooting with film is more complex and more flexible, he explains. Lee says he is part of the “crossover generation,” who experienced the last days of film photography’s dominance, ventured into digital, and, in his case at least, came partially back to film. “If you tell them to smile, they’ll probably laugh because you speak with a weird accent,” he says. “It’s what comes after the forced smiles that I hope to capture, that candidness.” As an ice-breaker, he brought a portable printer to Afghanistan and provided his subjects with their portraits, on the spot. His passion for faraway places began early in life. He was born in Taiwan, and moved with his family to Hong Kong at the age of five. After high school, he attended the Li Po Chun United World College of Hong Kong, which he credits with giving him an expansive world view. That entailed enrolling at Northwestern at 20, his English accent less than perfect (Mandarin is his first language), and his movie-fed expectations about America completely unrealistic, he says. There were a lot of disappointments at first—about food, cold weather, and lack of instant friends. Thus he found photography and a new home, as well as another major, in Weinberg’s art theory and practice department. He also found teachers whose advice has affected him deeply. “Pam Bannos [senior lecturer in the department], my technical mentor, showed me what a good photograph is,” he says. “She showed me Sally Mann’s "Immediate Family", beautiful black and white photography, and I thought, ‘If I could do this, I would be happy.’” He calls Jeanne Dunning, art theory and practice professor, his philosophical mentor. “She redefined for me what a good photographer is. Her work still changes and evolves,” he says with admiration. His philosophy has been brought to life most vividly in his award-winning work depicting the reintegrated child soldiers of Uganda. For this, his senior honors thesis, he traveled to northern Uganda in December 2005. “I did a series called ‘Twins.’ I photographed former child soldiers in pairs. One represented their haunted past, the soldiers who are forced to kill. The other represented their current status, their rehabbed self. This is the kind of series I want to do.” He says it presents an extra layer for viewers to discover, which makes the work interesting.